The Higher Education Academy (HEA) has called for proposals from UK higher education institutions to join the Green Academy Change programme. The call closes at 17:00 on Tuesday 27 November 2012. A conference on Climate Change Governance, convened by Kingston Law School (TEEL Research Group), will be held in London on 2 November 2012. Focusing on climate change litigation, climate change and forestry, pensions and climate change and possible future directions, the conference will explore the viability of existing legal mechanisms and the potential of emerging approaches. 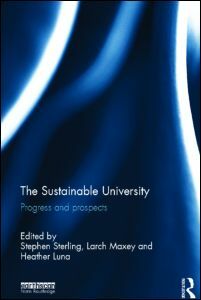 The Sustainable University: Progress and prospects, edited by Stephen Sterling, Larch Maxey andHeather Luna, will be published in February 2013 as part of the series ‘Routledge Studies in Sustainable Development’. Note: This suite of websites is not related to this book.